I am looking to put one of the "flock" in open C with 14 - 64 Baritone strings . My favourite is looking to be my Egmond .. would it handle it?? Do you mean CGCGCE or CGCEGC? I have had a few egmonds. There is no truss rod, and the necks are either like tree trunks, or like yours a little thinner. On the thicker ones, defo. But that one I'm not sure. The bodies are really thin wood too, so no guarantee it would withstand it. ok, yes that one is like one of my old ones - truss rod but thinner neck. 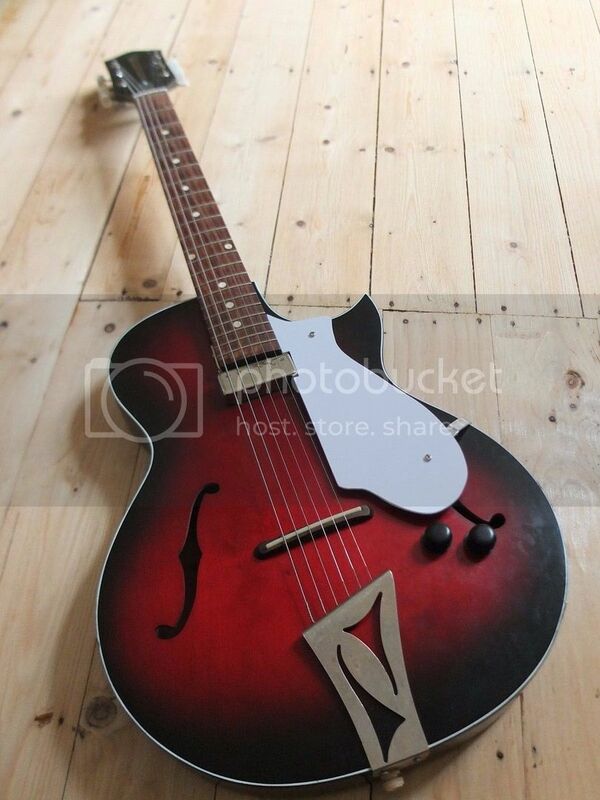 this is the type with massive neck but no truss rod. 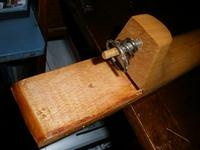 The guitar came tuned to B and is happy in B and at the right tension for picking or slide. I don't think the strings/guitar would be happy up a notch in C at all. 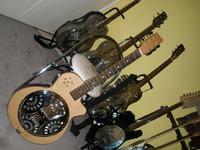 I keep my Lightening Resonator in Vestapol C and its awesome. Jono, I would be careful with the Egmond - the neck may be like a baseball bat but the neck / body joint should be the one to watch. A lot of these old European guitars were held together with animal glue which becomes brittle and weak with age. I had an old Hofner fitted with 12s literally fold up on me mid song (Purple Haze) in the late 1960s and still have a tiny scar to prove it. The pressure on the bridge and hence the body should also be considered. Although you may consider buying a "low tension" set remember that the unwound strings will still be steel and will probably have the same tension as normal. 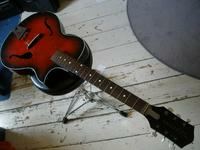 Maybe you should consider a guitar with a bolt-on neck, like an old Eko or something similar? Thanks, TT - that's worth sixpence! ...in that case, ignore my post above. Agreed, all my guitars are tuned down a tone, Standard Vestapol and Spanish. Suits me. Nice to see another Egmond out there, this is mine. It has a truss rod and the chunky neck. I’ve had it strung with a set of baritone strings (.068, .056, .044, .024, .020, .019) for a year or so and no issues whatsoever. Stays in open C.